In celebration of International Women’s Day, the good people at Pizzeria Delfina have put together a powerhouse roster of Bay Area female food and wine talent. Featuring five rockstar woman winemakers, including Ryme Cellar’s Megan Glaab and Burlingame’s very own Sally Kim who will be debuting her KPOP Rosé! Check out the four(+) course menu from Chef Melissa Reitz (of their sister restaurant Locanda) and DRG Executive Pastry Chef Elisha Smiley. Then get your tickets here. New year, new wines! Our winter 2019 release is live and features two brand new additions to the RYME portfolio as well our most recent take on the Hers Vermentino. Join us on Saturday April 6th from 1-4pm in FORESTVILLE for our annual spring open house and pickup party. We’ll be opening bottles of these fresh releases to share alongside complementary small bites. To ensure that your order is ready please send your RSVP for pickup to info@rymecellars.com. We are making gift giving easy for you this holiday season with two gift box options: a 3 pack selection of Ryme wines or a set of His and Hers Vermentino, both beautifully packaged in our gift box. So, whether you are spreading cheer to your family and closest friends, or buying for your corporate gift list, we have you covered this holiday season. 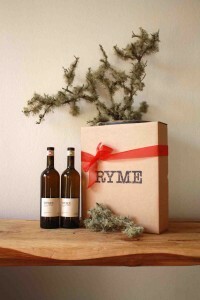 Just click on the “Purchase” tab in the menu above, or email us at info@rymecellars.com for information on customizable gift sets. Our holiday gift pack of 3 wines that is sure to please any wine lover in your life! This selection offers some varieties that are unique in California, are classically styled and easy to love: 2017 “Hers” Vermentino, 2016 Pinot Noir, and 2016 Cabernet Franc. Our duo of Vermentino from the 2017 harvest beautifully packed in a gift box. This set is an ideal gift for any wine enthusiast or couple that has ever disagreed. Enjoy reflecting on the nuances of each wine! Fall is in the air! We are excited to welcome the new season and open up our doors to you! Join us on Saturday OCTOBER 27th from 1-4pm in FORESTVILLE for our annual fall open house and pickup party. We will be pouring the newly released wines and serving up some delicious bites. To ensure that your order is ready, please send your RSVP for pickup to info@rymecellars.com. Summer is winding down and harvest is almost upon us! Our warm summer nights of bbq and friends will soon be giving way to the vintage hustle. We love the electric energy and buzz that comes with this time of year as we focus our sights on the incoming fruit. This seasonal transition and excitement calls for celebration, and what better way to do it than with paella?!?! Join us on August 25th for two types of paella, gazbacho shooters and prawn skewers! 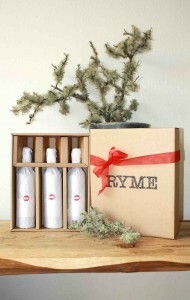 We will be popping Ryme wines from current and past releases to toast the new harvest! This is going to be a fun celebration and a party you won’t want to miss. Get your tickets soon, as space is limited! We look forward to kicking off our 12th harvest with you! Did you know that female sommeliers make on average $7,000/year less than their male counterparts? Or that over 60% of UC Davis Viticulture and Enology graduates are women but only 10% of wineries in California have a woman winemaker? Bâtonnage is an all-day conversation addressing the realities of women participating in all aspects of the wine industry. Our very own Megan Glaab will be a panelist at this amazing event and will share her perspective as a woman winemaker, small business owner, and mother. We hope you’ll join us to help bring this important discussion further into the light. Tickets can be purchased here. Join us and our great friend, Idlewild winemaker, Sam Bilbro at Cadet Wine Bar in Napa. Ryan and Sam will be on hand pouring an all-Italian lineup to compliment the Cadet’s tasty menu of vittles. Stop in to raise a glass, toss one back, and mingle with friends. 5/26 Chilean BBQ @ RYME Cellars in Forestville! Come kick off your Memorial Day weekend with us in Forestville for a Chilean BBQ. There is nothing we love more than gathering with friends and enjoying some tasty food and wine. When the sun starts shining we often have backyard BBQ’s and soak in this amazing life that Sonoma County has to offer. We count ourselves lucky to be good friends with Catalina and Rodrigo, a Chilean family that moved to our area a few years back. They are the best kind of people; thoughtful, caring, fun and generous. And they LOVE to BBQ. Rodrigo quickly got a reputation around town as being a master of the grill. Our children beg for his grilled steaks and balk at any other BBQ attempt saying “it’s not Rodrigo’s famous meat”. The bar is set high. For Memorial Weekend Rodrigo and Catalina are joining us at Ryme Cellars and will be serving up a traditional Chilean Asado alongside an assortment of Ryme wines, both current and past releases. We have a 6 foot trailer grill and a large selection of mixed cuts from Sonoma County Meat Company. This is going to be a fun celebration and a party you won’t want to miss. Get your tickets soon as space is limited! If you haven’t heard of Outstanding in the Field, check it out. A true innovation in dining and art. This is Table to Farm dining. And it is exquisite dining at that, in both flavor and aesthetics. Tickets go fast, so hurry and get one. The evening’s meal will be paired with RYME wines for a truly unique experience. RYME @ Spinster Sisters 3/30! An iconic pioneer of Sonoma County Cuisine, Spinsters Sisters will hosting RYME as part of their Spring Spotlight Series. We’ll be pouring and chatting with all of you about the wines and whatever is on our minds! No tickets, no prix-fixe, and everything is poured by the glass and half-glass. So you can stop by for a drink and snack or go all out with a sampling of small plates and pairings.